Back in 1989 my first and best mentor died, my grandpa lived next to me growing up and I spent many hours in his shop bugging him. He taught me a lot and little did I know years later I would still be repeating things he said in my head as I’m working. Gramps worked with oak and mahogany quite a bit so every time I smell either species I picture him looking over my shoulder. I think the coolest thing about woodworking is the legacy it leaves. I’ll be paying for something at a store (in my old home town) and someone will see my name and say “Hey are you related to Kenneth Powell?” When I answer yes they will tell me something like “He made me a table back in 1976 or a set of cabinets in 1978 and they are just as beautiful now as they were then.” Very rewarding work to say the least. 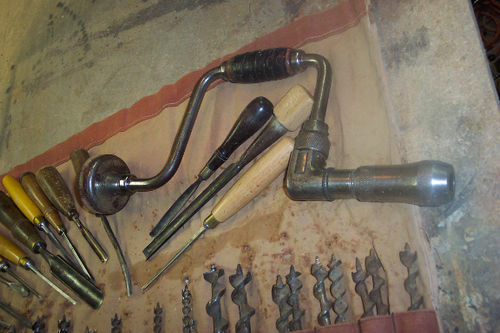 Anyway I’m rambling, when Gramps died his tools were kind of in limbo due to family conflict. My uncle got a hold of them several years back and was actually using them (which of coarse is what gramps would have wanted). But alas my Unc passed away also and when my cousins were going thru his things they asked if any of the rest of us would be interested in any of gramps stuff. 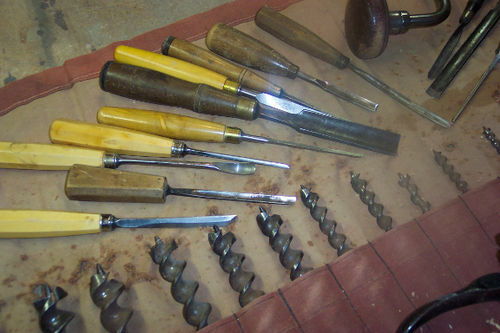 Well I jumped on that, told them about the chisels and remembering him using them, sharping them, and yes even making his own handles when the old worn ones finally broke off. 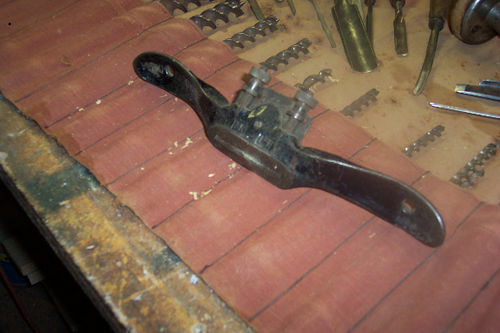 Gramps was pretty utilitarian when it came to tools, nothing fancy just what works and thats all, I remember him adding pieces of dowel to the end of a pencil so he could get the entire length of pencil used up LOL. So here are some pics of the chisels, plus some extra goodies my cousins thought I would appreciate, a brace with auger bits and even a spoke shaver, I’ve had these for a while now and use them all the time, the real neat thing is that the chisels are still soooo extremely sharp just like gramps sharpened them yesterday (at least thats what I like to believe). I’m going to look into what I should do to clean up the augar bits and start using them too. I keep the brace chocked up with a screw driver bit for when I don’t need to do too many screws cuz it reminds me so much of him. That’s wonderful to remember your grand father by the smell of certain woods or by using his tools . Thanks for sharing these memorys with us. Yes this is the most wonderful way, to use the tools, and send a thought each time. I wish when I pass away some one will send me a thought as they use my tools. I’m lucky enough to enjoy my Pops tools daily. I’m looking forward for all the family tools to get passed on as both my sons also enjoy woodwork and there is one grandson who I cant wait to share woodworking with. A long wait though, he aint quite 3 yet. prevent blow out, or use a clamped waste backer board. As ever, Gus the 71 yr young laborer, trying to become a carpenters apprentice. I like old tools. This is very nice. The older the tool – the better. Not to mention that when you are using those tools, you stay connected with Gramps. 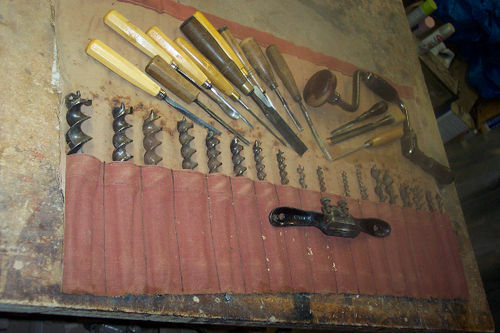 I have several of my Gramps tools, but his tools were mostly fishing rods and painters tools. Still nice to have them and use them. I understand these feelings completely. Stay connected. Thanks for all the kind comments…. I have to admit posting this got me teary eyed thinking about the days way back when…. Mads I’m sure you tools will live on for a long time, along with all the cool little devices you make..
Jamie Come on 3 is old enough LOL… I also got some things from my dad who passed away way too young, I’ve been thinking of making a plaque with gramps, dads, and mine pocket knives and give it to my son..
Gus thanks I’ll get me some emery cloth I also got this funky shaped sharpening stone that was gramps for sharping the gouge chisels..
Bill hee hee my most repeated thing from gramps is when I’m applying finish, I hear him saying hurry up hurry up you want this stuff even, back when the shellac was real…. but the clean up every day was one of his routines also.. I can only imagine how much you must cherish those tools of your grandfathers. Every time you work with them you will have memories of your grandfather and that is a wonderful thing.